The Affinity Robusto is one of the new offerings from Sindicato Cigars which is a new company that debuted at the 2013 IPCPR. The company is headed up by Jim Colucci, former Executive V.P. of Sales & Marketing for Altadis USA (makers of Romeo Y Julitea, Montecristo, and many more). Yet the actual company is formed of high profile cigar shop owners from across the Nation. The Affinity features a Ecuadorian Connecticut Shade wrapper with a Nicaraguan binder and fillers from the Dominican and Nicaragua and is available in 6 sizes. Make sure to follow Sindicato Cigars on Facebook, Twitter (@SindicatoCigars), and check out their website. Construction and Appearance: The Affinity Robusto features a single band which is very modern, almost futuristic actually, in appearance. The band is white with a grey A silhouetted on the background and says Affinity in the middle. The band also has the Sindicato logo on the back. The wrapper of the Affinity Robusto is a beautiful golden brown, with thin veins and a nice rich oil to it. The cap is a bit generous, but still seems well applied, and while the seams are visible, the construction still seems quite tight. The roll is quite tight, minus an extremely small spot right above the foot, which just has a very slight amount of give to it. Flavor and Notes: The wrapper of the Affinity Robusto has notes of hay, nuts, and a nice light sweet scent. The foot has the scent of hay, spice, a bit of cedar, and nuts. To prepare smoking the Affinity Robusto I use a guillotine cutter, and on the cold draw there are flavors of hay, cedar, and a nice sweet creaminess. Smoking Characteristics: The Affinity Robusto fires up with a nice mix of spiciness and sweetness. The first few puffs have a rich blend of nutmeg and vanilla, with just a little bit of cedar and hay. After the first few puffs, the spice mellows out, but the vanilla notes remain. The blend is now a bit sweeter with notes of cedar, hay, nuts, and the distinct creaminess. The draw is excellent, easily providing a full body of rich, cool, smooth, creamy smoke. The strength in this first third is in the mild to medium range. Into the second third of the Affinity Robusto, the flavor profile has not shifted too much. The flavors are still well defined and the blend takes on a bit more sweetness. A bit of the nutmeg has returned but none of the spice has. The notes of vanilla, hay, nuts, and cedar all remain. The ash holds firmly well past the inch point, and the burn is razor sharp. The draw is perfect, with just the right amount of resistance, providing a nice full body of cool, creamy, sweet smoke with each puff. The strength remains in the mild to medium range during the second third. During the final third of the Affinity Robusto, the complexity of flavors increases. The note of cedar has really faded from the profile, and the sweetness in the blend is becoming much more predominant. The notes of vanilla, hay, nuts, and nutmeg are all very present, and blend well together. The construction is still excellent, the ash is very firm, with no flakiness, and the burn is razor sharp. The draw offers the perfect resistance, and easily provides a full body of rich, cool, smooth, sweet smoke with each puff. The strength never peaks above mild to medium, but still offers a nice mellow feeling. 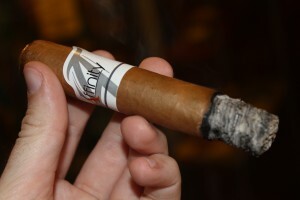 The Affinity Robusto smokes cool to the nub, remaining very firm and sweet. Conclusion: I have to say, right away I am a fan of the Affinity Robusto. There are a few mild cigars with claim to offer a “super” premium experience, and for the most part they all fall short (a side from one or two exceptions). 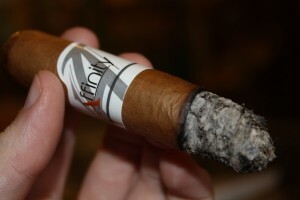 The Affinity Robusto offers a comparable experience to a super premium mild cigar, and at nearly half the price. I’m pretty certain that the Affinity Robusto is going to become my new morning smoke, and I would consider this a box worthy cigar.